Seasonally adjusted output grew by 0.5 per cent in December 2018 from the month before. In December, working-day adjusted output was 2.7 per cent higher than one year before. According to revised data, working-day adjusted output increased in November 2018 by 2.6 per cent (previously 1.8 per cent) from November 2017. Working day adjusted primary production grew by around five per cent, secondary production by around three and a half per cent and services by about two per cent from December 2017. Seasonally adjusted GDP is estimated to have risen by 0.9 per cent from the previous quarter. 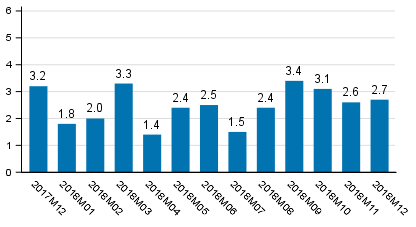 According to the series adjusted for working days, GDP was 2.7 per cent up on the corresponding quarter of the year before. It is estimated that the number of the employed has increased by around 2.8 per cent from one year ago. Adjusted for working days, the number of hours worked was around 4.2 per cent higher than in the same quarter of one year ago. 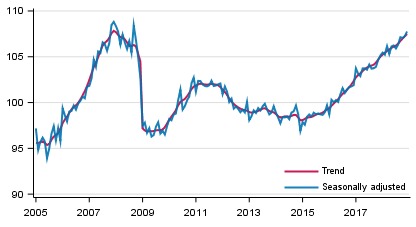 The data are based on preliminary data of the Trend Indicator of Output. The next quarterly national accounts with more detailed data will be published on 28 February 2019. 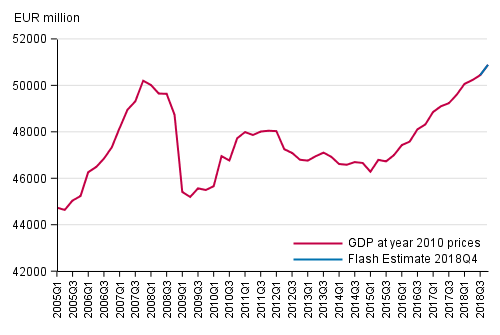 Intermediate consumption, as well as taxes and subsidies on products are not estimated in the compilation of the quarterly flash estimate, but quarterly GDP is carried forward with a change based on the data of the Trend Indicator of Output. ISSN=1798-5439. December 2018. Helsinki: Statistics Finland [referred: 19.4.2019].